Jenn Fields, reporter for the Boulder paper, contacted me recently about the practice of sharing information about boulder problems via blogs, Facebook, etc. I have a lot of videos posted at this blog for this purpose. She also talked with Jon Glassberg, routesetter at the Spot and prolific video maker. 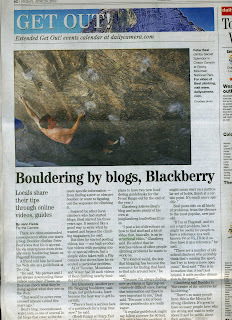 The story was a good look into the changing landscape of media in climbing. 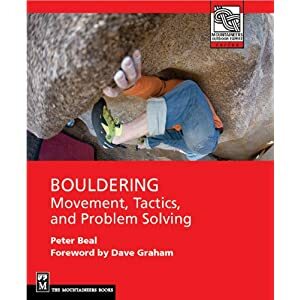 I definitely think guidebooks have a permanent role in the climbing world but there is no question that, regardless of climbing level, more and more climbers do a Google search to see if a video is available for their project. The widespread availability of cheap cameras and editing software has pretty much ended the idea that climbing video per se is special and a more information-based model for video is taking over. Obviously bouldering with its short video times and dynamic nature is a perfect fit. Speaking of video, the short clip I made of Jimmy Webb on European Human Being was posted on 8a.nu and was seen well over 2000 times that day. I just happened to pull out the camera in time for what turned out to be Jimmy's last try, the one he took after he was supposed to be done. Moral of the story? Always have the cameras on hand and ready. Also speaking of videos, I will soon post a review of Rocky Mountain Highball, kindly sent to me by Andy Mann. Rocky Mountain Highball - Official Trailer from Yama Studio on Vimeo. Rocky Mountain Highball - OFFICIAL Bouldering Teaser from vas entertainment on Vimeo. The tech point is when you send a project but sussed the heck out of it online before the send, which seems to be happening more and more frequently. Regardless, it sounds like a cool newspaper article you worked on. Nice work! Blogs, Facebook, videos etc are the go to source for route preparation in today's world. But unless you have a smart phone and you're climbing next to a cell phone tower, getting access to blogs, facebook and videos will out in the woods can be an issue. That's were the guides come in handy.